Dukes Wood whilst suggestive of a naturalised English woodland is managed and maintained through a structured programme of non-intervention. There is a strict code of practice when it comes to the wood’s upkeep as a Site of Special Scientific Interest (SSSI). This status evolved directly from the woodlands’ industrial heritage as the UK’s first onshore oil field. Clearings made to house oil-drilling equipment re-naturalised over time to become new habitats for contrasting and rare or unusual species. In addition, an early example of corporate reclamation introduced a programme of planting non-native trees following industrial vacation of the site. As such the site itself is a composite of man-made and organic processes; an antagonism between the artificial and the natural. With this in mind as a backdrop to our research, we wanted to begin by exploring the site’s relationship with material production and futurism. During the post-war period of the 50’s and 60’s new industrial processes and material sciences enabled the ability to design and make exciting new products. There is then, an evident tension in the relationship between the natural and the man made. Our given site, is a place of great natural diversity in delicate ecological balance. However, this status is greatly indebted to the extensive human and technological interventions over the years that result from its role in the production of oil. Plastic is also a material of tensions. As a material derived from natural substances (commonly oil, but also cellulose, and organic proteins) it represents an antagonism between the artificial and the natural. We might argue that the modern world has been shaped by plastic to the extent that it is difficult to imagine everyday life without it. But at the same time it is impossible to ignore the damage that its production and use has caused to the planet. It was at this point, as a way of exploring these tensions, we became interested in the possibility of making plastics from materials available on the site. In contrast to the increasingly problematic relationship between society and traditional methods of producing industrial materials, we started looking at new kinds of plastics made in more environmentally sensitive ways. Beginning with learning more about natural polymers, we encountered a new ‘wonder’ material called nanocrystalline cellulose (NCC). NCC is made from treated cellulose, one of the primary molecules that makes up the cell walls of plants and trees. At a molecular level NCC has a crystalline structure in contrast to the string-like structure of other polymer-based plastics. As a result it has many of the material properties of a metal; it is an electrical conductor and has an incredibly high strength to weight ratio (8 times that of stainless steel). 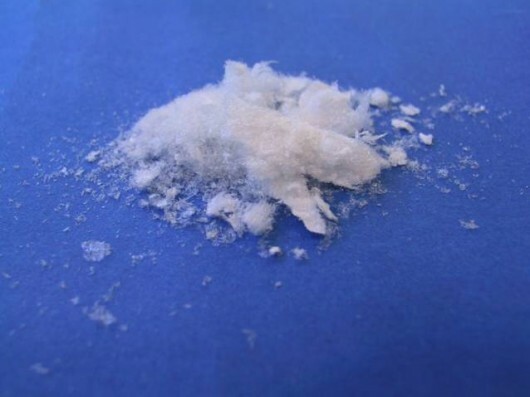 It is also transparent and biodegradable; the latter allowing it to be used in natural systems, including the human body, with little adverse effect. Importantly, it isn’t necessary to fell trees in order to make NCC. It’s nano scale structure allows for it to be easily made using fallen twigs, leaves, or even sawdust . These properties make it a material that seems to be able to do it all. Japan-based Pioneer Electronics is applying it to the next generation of flexible electronic displays, while IBM is using it to create components for computers. Even the US army is getting in on the act, using it to make lightweight body armour and ballistic glass. .
Celluforce En from Departement Web on Vimeo. Interesting parallels can be drawn between the plastics of the post-war era and this new material. The rhetoric surrounding NCC is aspirational and hopeful, it promises new things and new solutions to old problems. As plastic did, NCC seems to set its sights firmly on ‘the future’. This relationship between the future a material (or technology) might promise, and that which it might deliver, is another aspect of our interest in this project. Over the coming months, we are planning on visiting the Cellulose and Natural Materials Group at the University of Exeter, to interview Professor Stephen Eichorn and get a better understanding of the NCC production process. Alongside this we are going to be investing in laboratory equipment to test fabricating NCC on a small scale using plant matter from the site and other areas. Our intention is to reveal the process of producing this material and interrogate what it might mean for this place to return to being a material producing community. J.L. Meikle (1997) American Plastic: A Cultural History. Rutgers University Press. Unlike any other woodland where the focus is on life at the surface, a visit to the Dukes wood site and its oil museum makes one wonder and dwell on the geology of the earth, right under your feet. It triggers awareness to the current status of the planet and our quite unique experience of 200 years of oil-powered economics, an era, which is predicted to come to an end in the next 50 years. Oil has provided us with new materials and a very convenient and accessible source of energy. During this era, we will have released vast quantities of atoms stored in fossil crude oil locked away for the last 160 to 60 millions of years. Clearly there are different time-scales involved. Our bodies only store molecules for about 70 to 80 years. In the next 160 millions of years our planet will look completely different due to the activity of living creatures and physical processes, it is impossible to predict how long human life will sustain in the time scale of the future, yet not indefinite, life of the planet. 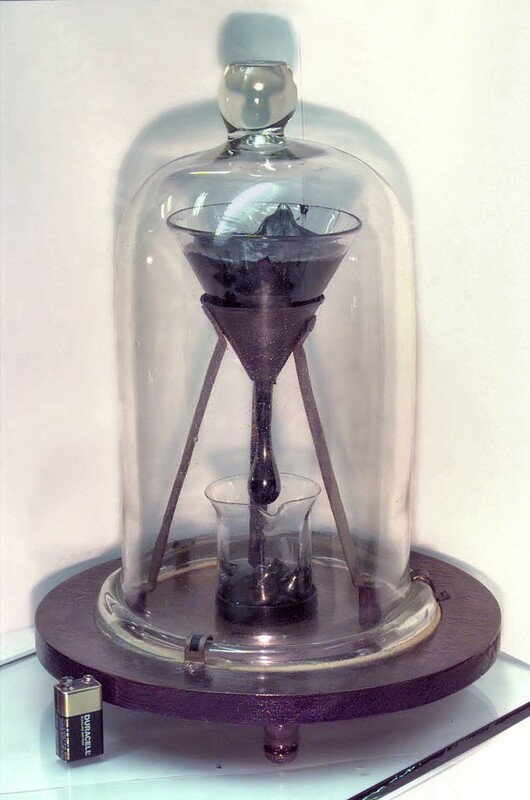 In my research for the project I came across the Pitch Drop Experiment at the University of Queensland (See Fig. 1). The extremely slow movement of the drop under the forces of gravity depicts in a minimal way the slowness of the physical processes of our universe, including its development of matter and life. In contrast, humans value the planets resources, which they now control by economics. Economies are based on relatively short-term processes and display irrational behaviour. Why are diamonds more valuable than water? We can use diamonds to cut other materials and in jewellery, but without water we cannot survive. Why is gold a standard for wealth? Who owns oil? The people who happen to live on top of it? Or those who discovered it? 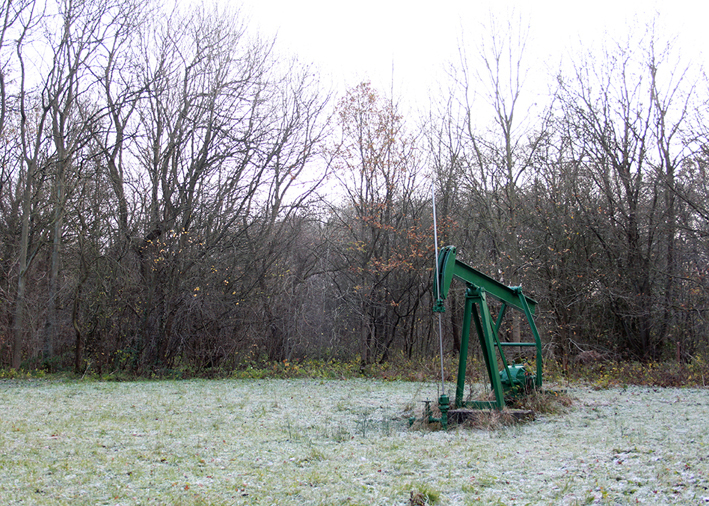 It is fascinating how after 47 years nature has already reclaimed this site of oil exploration and industrial activity. We now have to focus on the ways, in which we have to adapt ourselves to our changing environment, depleted resources and increased population, and how we will support human and non -human life on our planet. For Dukes Wood Project I intend to create an installation, an incongruous artificial environment in which we nurture forestry growth. It has the working title ‘Nurturing, prototype 2’. I currently intend to experiment with the idea of tending to a part of the wood by first sheltering from direct sunlight, and then providing it, at the discretion of the viewer, with artificial light for growth. The sheltering sheets that will cover the undergrowth and the daylight light bulbs will be Corrugated Bitumen Black Roof Sheets; this will be installed at relatively low level above the ground as to be able to assist the growing of the plants, shrubs and woodland. Now, decisions have to be made on how to realize this: install it in several small shelters, make parallel rows, to cover up a single larger area? Which configuration? What would be most beneficial to the woodland? I will install a light switch which enables the public to switch on the lights again as they are under control of a timer. This way the audience can assist in influencing and nurturing this precious section of woodland. Fig 1: Begun in 1927 by Professor Thomas Parnell, this experiment was meant to reveal the surprising properties of an everyday material: pitch. Pitch is the name of a number of hard tar-like substances and in this case bitumen was used. Though at room temperature pitch appears to be a solid and can be shattered by a hammer, it is in fact a very high-viscosity liquid, and Professor Parnell wanted to prove it. Nottinghamshire is well known for Sherwood Forest largely because of Sir Walter Scott who almost single-handedly created the most famous imaginative historical forest in the world in 1820. He did this by setting a crucial meeting between King Richard I and Robin Hood within Sherwood Forest in his historical romance Ivanhoe. This novel was a runaway success in Britain, the United States and around the globe and by evoking a medieval world of friars, maidens and battling monarchs Scott unwittingly unleashed a desire by many to visit Sherwood Forest. The forest was not without literary connections before Ivanhoe. William Shield’s comic opera Robin Hood: Or, Sherwood Forest opened at Covent Garden on 17 April 1784 and was frequently performed throughout the late eighteenth century. But it was Ivanhoe which catapulted Sherwood Forest into the international popular imagination of the early nineteenth century. Most of Nottinghamshire north of the River Trent was once part of the Royal Forest of Sherwood. 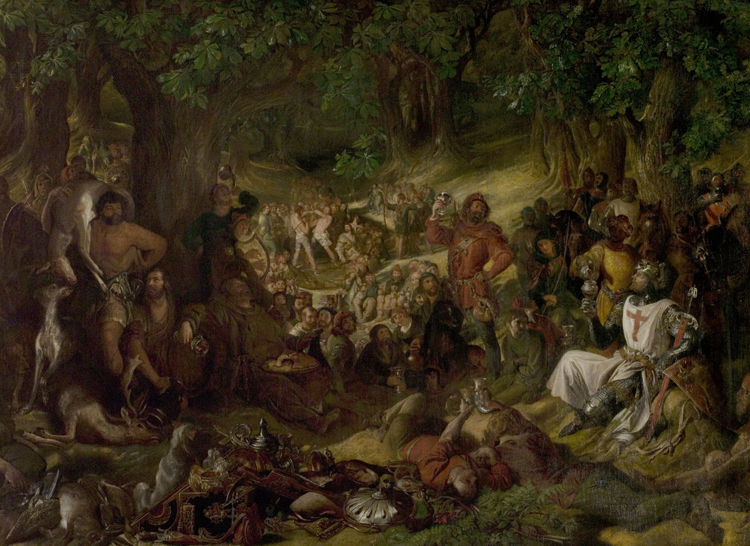 Like other medieval royal forests, Sherwood had come into being to protect monarchical hunting rights. Most forests contained some woodland, but they also included villages, heaths, arable land and pasture and Sherwood Forest consisted of settled agricultural land, large areas of heath and the town of Nottingham. The core of the forest was to be found on the sandy soils of western Nottinghamshire. The power of the medieval monarchs over their Royal Forests was moderated following the Charter of the Forest of 1217 and after the 1220s, most of the land in eastern Nottinghamshire on the heavy clay soils, was no longer subject to Forest law. Medieval forests, although strongly associated with dense, woody vegetation and historical continuity, in practice usually included large areas of open land and frequently had their boundaries changed. Today, the eastern part of Nottinghamshire has many surviving ancient woods, that is, woods which have existed for at least 400 years or so. These woods are particularly valuable for wildlife and several have become nature reserves managed by Nottinghamshire Wildlife Trust in recent years, such as Treswell Wood and Eaton and Gamston Woods. Dukes Wood, on the borders of the parishes of Eakring and Winkburn, is also a nature reserve. These woods have characteristic trees such as oaks, ash, elm, hazel and birch with a rich ground flora of bluebells, primroses, wood anemone and yellow archangel. The woods have been managed for centuries largely under the system known as coppice with standards. These coppice woods were known in the eighteenth and nineteenth centuries as spring woods, and if you look at George Sanderson’s Map of the Country Twenty Miles Round Mansfield of 1835, you can see that woods in Eakring and Winkburn are named ‘Redgate Spring’ and ‘Orchard Wood and Nut Wood Spring.’ In the 1790s the Winkburn Woods were coppiced every twenty years and were being replanted with ash; in Kirklington the coppice was cut every fourteen or fifteen years. Many of the poles cut were used as hop poles and this was a lucrative market as hop growing was one of the leading agricultural activities in east Nottinghamshire in that period. A close look at the map, however, shows that the name Dukes Wood does not appear. The adjoining Dilliner Wood is marked, and Dukes Wood is shown, just to the west of Dilliner Wood, but not given a name. 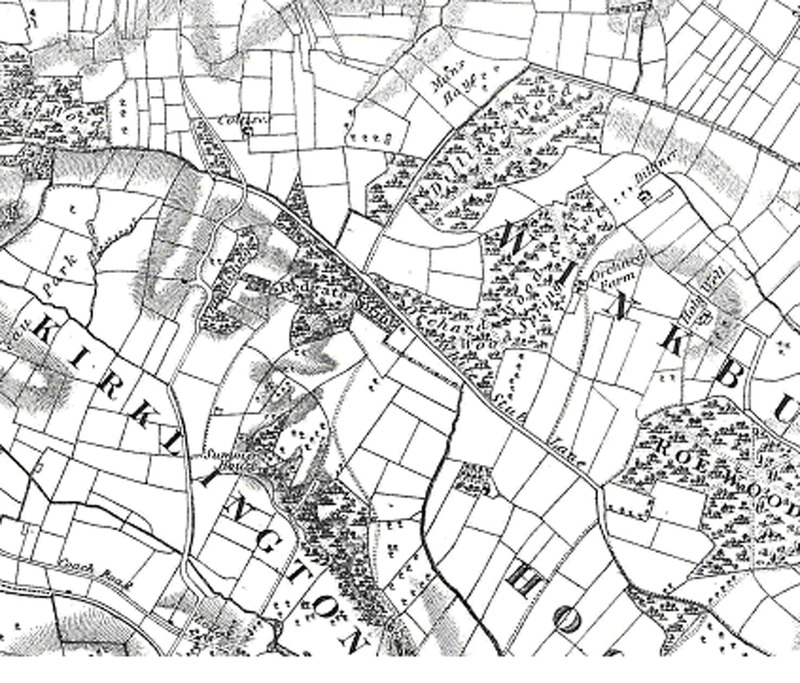 The map also shows that Dilliner Wood was much larger in the 1830s and part has been cleared and converted to agricultural land since then. Moreover, much of the land which now forms Pudding Poke Wood was not woodland in the 1830s. Woods, just as medieval forests at a much larger scale, frequently change shape and size, sometimes disappearing entirely and sometimes growing in area. Woods are often seen as stable elements in the landscape, but in practice are constantly changing.